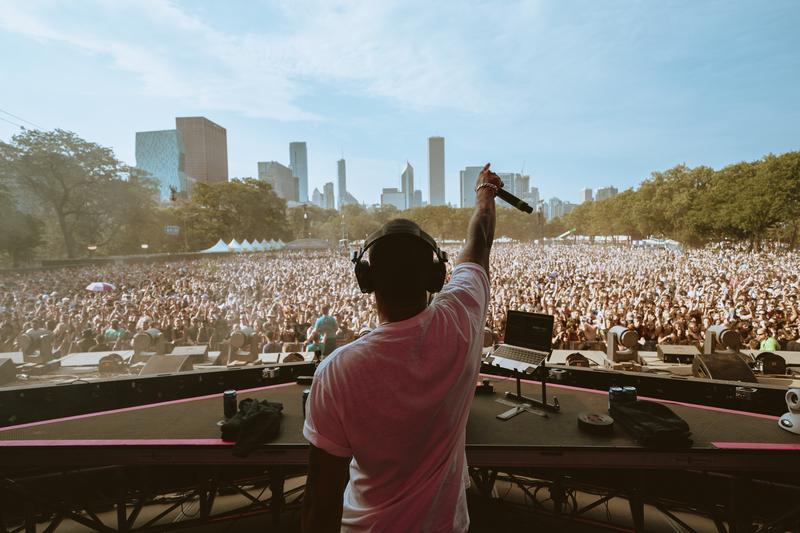 Artist Troyboi performing for a massive crowd on Perry’s stage at Lollapalooza. Photo courtesy Lollapalooza media/Roger Ho. If you’ve ever been to a live concert you know how amazing that experience can be. Now think about that experience and multiply that by 100 and you get Lollapalooza, the four day music festival at Grant Park in Chicago. For many, this music festival marks a yearly tradition of heading into the city to see some of the years biggest and most talented artists from all genres and parts of the world. This year marked my third weekend of Lollapalooza, and I could not be happier with how it turned out. The beautiful thing about Lollapalooza is how spontaneous it ends up being. Whatever plan you have for the day will most likely get flipped on its head, and that is fine. On the first day, I started with some friends from home, but after a lunch break and water pit stop I managed to lose track of the group. This gave me the chance to wander around for a bit, see some great performances that I wouldn’t have gone to with a big group of friends and eventually meet up with some people from Butler. During this time, sophomore marketing major David Strickman was experiencing the festival for the first time. Strickman said the atmosphere in the park alone made for a great experience for him. “Just being in Grant Park around thousands of people who are all excited and have positive energy throughout the whole day is an amazing experience,” Strickman said. Although the large majority of the weekend is full of fun, exciting and overall positive experiences, there are definitely times where you are either scared for your life or someone else’s. On two separate occasions throughout the weekend I was inches away from getting knocked out by an unintended punch from a fist fight in the mosh pit of the crowd. There were also times at the Lil Uzi Vert show on Sunday where breathing became a serious issue in the depths of the crowd and dehydration was striking people down left and right. Getting lost, finding other friends and rolling with the punches, literally or figuratively, is all part of the Lollapalooza experience. Rapper G Herbo gets up close and personal with his crowd on the American Eagle Stage at Lollapalooza. Photo courtesy Lollapalooza Media/Roger Ho. Nolan Cardenas, a senior clarinet performance major, was also attending Lollapalooza for the first time. Cardenas saw lots of new artists that he had never heard of before, and now he said he plans on listening to the new artists regularly. Like Strickman, Cardenas also felt that part of the experience comes from the people that are there to share it with you. When you go to a music festival, you are going for the music, but for many, that is not what makes the whole experience memorable. Zack Okolita a junior marketing and risk management major, said he feels that the people you are around have just as much of an impact on your overall experience as the music does. Everyone that I talked to reiterated the same idea. Sure, the music is fantastic and is what draws hundreds of thousands of people every year, but without the close friends and random interactions with others, the festival would not be the same. Colton Hayman, a junior international business and marketing major has been to Lolla three times now and loves the energy and emotion that Lollapalooza brings every year. The feeling of being at a music festival, surrounded by friends and listening to good music is infectious. If you want to experience this for yourself there are thousands of music festivals around the country, all with their own unique experiences. In a few weeks I’ll be at the hip-hop music festival Chreece in Indianapolis. Chreece is a relatively new festival in Indianapolis and strictly showcases hip-hop artists and DJs from the midwest, mainly highlighting talent from Indiana. Recent Butler graduate Aaron Marshall, also known as Double A, will be performing as well as popular Chicago artist Valee, the 90’s hip-hop group Black Moon and many more. If you want to explore new music, a new city, meet new people or spend quality time with friends, making it to a music festival is one of the best ways to do all of these things in just a few days. And if you ever get the chance to make it to Chicago for Lollapalooza weekend, I can assure you it will not disappoint. Just make sure you drink a lot of water.